Acne occurs when the pores on your skin become blocked with oil, dead skin, or bacteria. Each pore is the opening to a follicle. The follicle is made up of a hair and a sebaceous (oil) gland. The oil gland releases sebum (oil), which travels up the hair, out of the pore, and onto your skin. When the follicle of a skin gland clogs up, a pimple develops. Hormonal changes, heredity, cosmetics, medications and the foods you eat may all trigger an acne breakout. Most acne is found on the face, neck, back, chest, and shoulders. While it is not a serious health threat, it can cause scarring � and in black skin, which is more prone to hyperpigmentation, scarring is especially problematic. Acne treatments are not race-specific, but in any event, I recommend consulting a dermatologist before embarking upon any acne treatment for African American skin (not least because common skin conditions like rosacea, staph infections and allergic reactions can be mis-identified as acne). Once you have identified what kind of acne you have - and hopefully, the trigger(s) - your dermatologist will have the expertise to guide you in the long-term treatment and acne scar removal strategies, based on your skin type. Benzoyl Peroxide is available in 2.5%, 4%, 5% or 10% formulations. It works by killing the bacteria, reducing inflammation and unplugging blocked pores. Start with the mildest formulation unless otherwise directed by your dermatologist. Usually taken over a course of seven days. Be sure to complete the course � even if you think you�ve been healed! Topical antibiotic creams such as clindamycin can also help. Available over-the-counter cosmetically in low doses, but usually dermatologist-prescribed. Effective in unblocking pores. Used to treat extreme cystic (or nodular) acne when benzoyl peroxide and clindamycin treatments, for example, have proven ineffective. Vitamin C can indirectly prevent blocked pores and acne since it does get built into the tissues of the epidermis, the outer layer of your skin. More vitamin C in the epidermis can also protect against the inflammation of acne by UV rays in the sun. Vitamin C is not a true �sunscreen� because unlike vitamin A it doesn�t directly protect cells against UV light. However, its real power is just as potent against acne: vitamin C scavenges the large amounts of free radicals which sunlight can form. Free radicals from UV rays can be a notorious cause of acne. Don�t overwash/scrub: this can lead to more oil production and more problems. Use only alcohol-free skin products: alcohol is drying and can aggravate skin already dried by benzoyl peroxide and similar formulations. Use oil-free and non-comedogenic (non-clogging) cosmetics/skincare And avoid mineral or silicone-based products, regardless of the miracles they promise! Keep your hands off your face! Must scratch that facial itch? Use a knuckle � it is likely to be cleaner than your fingertip. Eat plenty of green, leafy vegetables: spinach, kale, broccoli are said to be the Big Three in promoting healthy skin. Snack on antioxidant-rich berries: choose blueberries, cherries and goji berries for best results. Enjoy dark chocolate in moderation (ensure it is made with at least 70% cacoa): this sweet treat contains zinc � another acne-fighting nutrient. Eat pumpkin seeds (also chock full of zinc). Drink green tea (famously loaded with healing antioxidants). 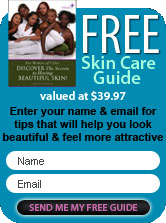 There is a dizzying array of black skincare products for acne scar removal/hyperpigmentation. Note that many over-the-counter products, manufactured for this purpose, contain harmful mercury � these are banned in the USA and several other countries, but some may still find their way to smaller stores. Be vigilant about reading the fine print when choosing a scar removal/ fade product. While this is perhaps the most well-known treatment, you should proceed with caution. Some studies have shown a link between hydroquinone and certain cancers. Its use in skin care products is actually banned in most European countries. Dermatologists will usually approve only �medical-grade� formulations in either liquid or cream form. Misuse of hydroquinone (it is only intended for short term use on small areas) can lead to a blue-blackening of the skin (ochronosis), so if you decide to use it, be sure you follow directions exactly as given. These two products are commonly used in hydroquinone-free formulations and can be found in soaps, creams and serums. Performed by dermatologists using either filler injections (every 4 � 6 months) or ablative lasers. These techniques can soften and flatten raised acne scars or keloid scars. Please! Especially if you are using a hydroquinone product. And in any event, use a sunscreen of at least SPF30 to protect delicate skin and prevent re-darkening of scars. Picking can lead to further scarring - and the depositing of bacteria from fingertips and under the nails can cause another round of acne. Contrary to what you may have heard, Vitamin E is not good for scars. According to a study out of the University of Miami, Vitamin E may actually hinder healing. In the study, Vitamin E had no effect or made matters worse for 90% of patients � and 33% developed contact dermatitis. Don�t despair � the right acne treatment for you is out there. Let the medical experts guide you and have patience.